Christian Writer/Reader Connection: CONTEST! CONTEST! That sounds wonderful. I'd love a chance at the book! Wasn't this her first book? And it soared to bestsellardom? Sounds interesting and a little heart-wrenching. Hey Susan, I'm having a contest on my blog too :) Sounds like a good book and I'd love to be entered. Hope you had a great weekend! I think you'd enjoy it. :) Thanks for entering the drawing. I don't know, but inside the book it says that Romantic Times gave it 4.5 stars. Did you want to enter the drawing? Great! I'll pop over there as soon as I can. I enjoyed Deb's book. She gets down to the heart level. I've never read any of Deb's book, but I'd love to. I met Deb at an ACFW conference and I was struck by how sweet--sincerely sweet--she is. Thanks, Susan, for this great contest. Sounds like a great contest! You always have such fun giveaways! Thanks for the compliment. :) Consider yourself entered. I've never met her, but have read this book. :) Maybe you'll win. This book sounds like my kind of read! Please enter me and thank you for thinking of me with health insurance. I might ask for information. You're welcome. It's a possibility. wow, a great timing for me to find out about this book which sounds like a wonderful read. My dh and I are faced with my news of my having breast cancer and the treatments of what to follow. We are married 20 yrs. on this Wed.
*I deleted my comment and re-entered as I'd forgot my e-mail addy. I'm so sorry to hear of your diagnosis. Quite a few people I know have undergone treatment and are doing well. I've read one of Deb's books and really enjoyed it. Please enter me to win!! I'm grateful for all my faithful readers. Just found your blog today (from "quietspirit") and I am so excited to find you. I love to read and will look forward to your recommendations! Wondering if you ever do blog tours (for books from major publishers)? Tissues would definitely be a good idea. While I don't participate in formal blog tours, I do belong to the Thomas Nelson, Revell, and Tyndale Blog Networks. Occasionally, I'll request a book from them for review. 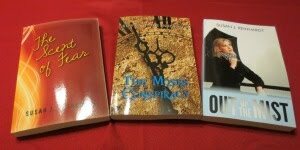 I try to read a wide variety of genres from romance to speculative fiction. Author interviews are also a favorite around here. Feel free to explore older posts for book reviews. Welcome! We love readers around here. This sounds so sad. I bet it moves the soul. I'd love to be entered. Hey everyone - Jen has a contest with some nifty prizes. Hop over and check it out. Cindy also has a contest going. This book makes me think of my friend whose husband has cancer. They have been using his illness as a way to witness to others, especially those they have met at the hospital. Plus, they have shown great faith in the Lord throughout his treatment. Can't wait to meet you next week! Susan, I came home from a visit with our son in Seattle to find your note! Thank you for letting me know about your drawing, and thank you so much for your kind words about my book. I really appreciate you passing it on to another reader through this drawing. Thanks for stopping in to comment. I'm sure the winner will be touched by your book even as it blessed me. sounds like an excellent read; I have been diagnosed with breast cancer and we just had our 20 yr. anniversary. Would love to read this book and thanks.